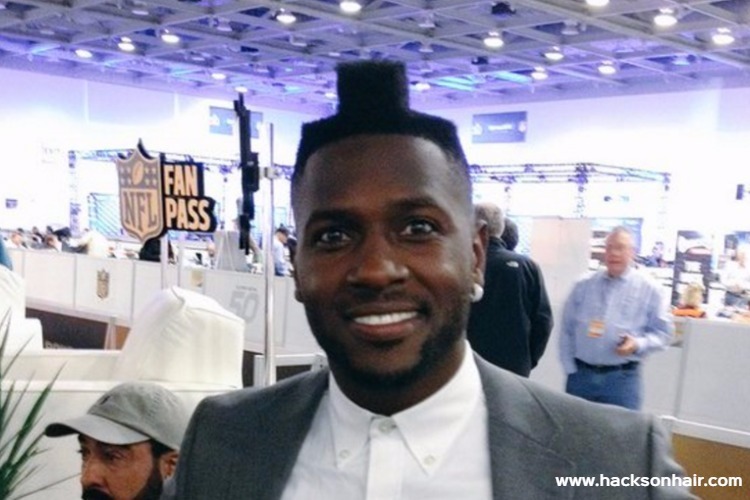 Antonio Brown Haircut might be the worst Haircut you've seen until now? Antonio Brown Haircut might be the worst Haircut you’ve seen until now? We’ve seen many variations in Hairstyle that celebrities wore, but Antonio Brown Haircut is the worst that we’ve seen until now. Before getting in full details. Let’s talk a little about Antonio Brown. He’s and American Footballer and Punt Returns for Pittsburg Steelers. In 2016, Antonio Brown got a haircut and that shocked everyone. Which apparently led to the beginning of Antonio Brown Hair Meme Trend. He was fine looking with a short haired bald look but this hairstyle is quite a different. Not only Antonio Brown got a ridiculously Haircut, He even named it. Let’s check out the complete details of his haircut journey. This is the look that shocked everyone. Antonio got this bizarre haircut that no one every dared to get in their life. Being a celeb he has more guts. To maintain that celebrity image everyone should keep a good track on their image and style down the road. Obviously, there will be a lot of attention on him from fan’s & media. In 2016, Antonio Brown got this weird haircut for his upcoming super bowl and the news was out by the official Twitter handler tweets about this. He even named the haircut. After he was in this hairstyle he thought of likes and being a celebrity he inspires people. Some part of the inspiration might result in his fans actually getting this haircut done for themselves. So he foresees the circumstances and named the style as ” The Lego “. What he hadn’t thought was that 1. The haircut is awfully looking and like no one will ever try this. 2. If they do, They might end up looking like a weirdo and nothing else. I would say ” Punk ” to be precise. Then he’ll look in a Flat Top Haircut but still it’s better than Antonio Brown Haircut A.K.A ” The Lego ” ? ?. What do you guys think about his new haircut? Will he surprise yet again? Or will he revert back to old look and stop sporting weird & ridiculous looks? Leave a comment a below and don’t forget to share this on social media. Katrina Kaif Side Shave Haircut is a Surprise which is difficult to Digest! ? ?